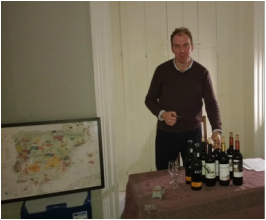 Our regular wine tasting host, Tom I'Anson entertained us in Church House on 27 November(our last time there as it's now been sold) . We had 34 members there. Our best turn out to date. And we raised more than £200 towards SPJARA's funds. Tom talked us through six delicious wines from various countries. It was a great evening - a good way to meet old and new friends and neighbours and to stock up for Christmas. Once more Tom I'Anson introduced SPJARA members and guests to a new wine experience. There were six wines from Chile and Argentina, served with plates of cheeses. Thanks to Carol and Maurice Gran - and to Jonathan Moffitt who between them made the very enjoyable evening possible. ​31 came and we netted £178 for the SPJARA funds. It seems that Tom sold quite a few wines too. ​​The pre-Christmas SPJARA wine tasting has become a popular event. 27 members and guests turned up at Church House on 17 November to taste wines from Spain selected by Tom I'Anson. We sampled a range of Spanish whites and reds (plus a bottle of port). Tom got some orders, and we all left feeling a little merry. And we have added nearly £200 to our fund for small scale environmental improvements in the area. (With special thanks to Carol James, Maurice Gran and Jonathan Moffitt for the success of the event).